A few weeks ago, while crossing the parking lot to get into ECHO, it felt a lot like spring. Instead of cold winds whipping across the lake and snow crunching under my feet I trudged through muddy puddles with my parka, mostly unzipped. To be frank, there hasn't been quite as much frosty weather or powdery snow as I had hoped there would be for my first winter in Vermont. But not to worry! This week I've found my winter inside ECHO Lake Aquarium, instead of outside on the mountainsides. 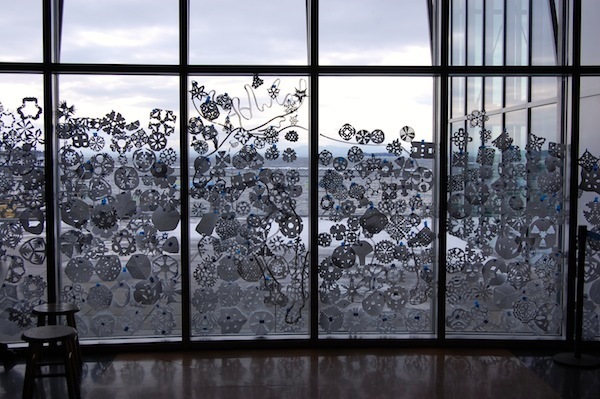 Children and adults are getting into the winter spirit, cutting out intricately designed paper snowflakes and piling them up as high as a moose on the windows in the Adirondack Alcove, overlooking Lake Champlain. I have especially loved the "zooflakes" which use animal shapes as the basic shape for a snowflake. Guests are also sharing their favorite snow stories. It's great to hear about peoples' first memories of snow or their favorite experience of rocketing down a mountain with friends. I've also heard dozens of stories about snow, winter, sledding and skiing and some of these are up on the wall for everyone to enjoy. And then there are daily snowball fights. That's right! Every day we gather together to fling cotton balls at each other, pretending that those fluffy white puffs are the real thing. Even though they don't freeze our hands some participants refuse to take their gloves off. The excitement is increased because we use catapults to fling the snowballs across the room. Just today I was blasted from all sides by giggling, enthusiastic, young, snowball-flingers eager to continue their epic cross-classroom battle until I told them it was time to clean up. One of these days it really will be Spring (or Mud-Season as I've been told), but until then the snow will be flying in ECHO. Come join us through Tuesday, March 6th for our daily snow (cotton) ball fights. And for now, at least, I remain content that my first winter in Vermont provided more snow inside, than out.